Protest! 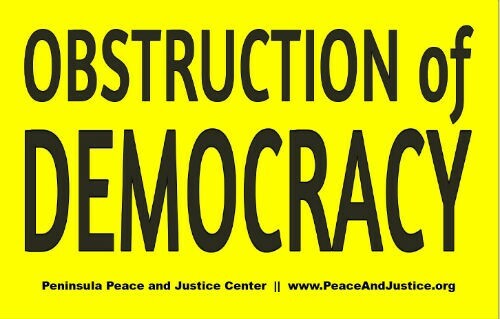 Protect the Russia Investigation! It has happened. By replacing Rod Rosenstein with just-named Acting Attorney General Matthew Whitaker as Mueller’s boss overseeing the investigation, Trump has undercut the independence of the investigation. Whitaker has publicly outlined strategies to stifle the investigation and cannot be allowed to remain in charge of it. 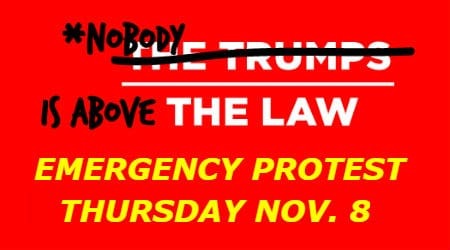 Our protest event will take place in coordination with over 300 others nationwide, on November 8, 2018 at 5 PM local time beginning at Anna Eshoo’s office in Palo Alto at 698 Emerson St. After forming up on the sidewalk and minding the instructions of the event monitors we will march over to the Palo Alto City Hall Plaza for a rally sponsored by the Peninsula Peace and Justice Center which will feature songs by the Raging Grannies. Please bring signs and noisemakers of any sort. Some signs. like the one below, will be provided.